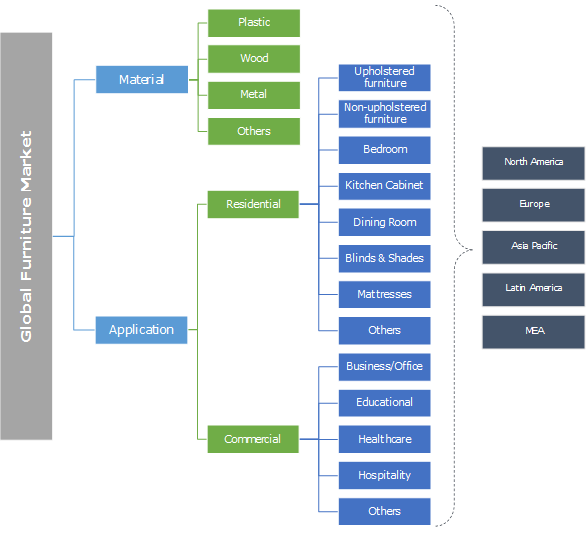 Global Furniture Market size was valued at over USD 540 billion in 2017 and is anticipated to witness significant gains at around 5.5% from 2018 to 2024. 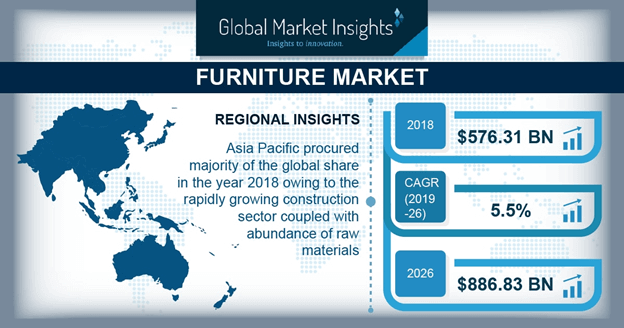 Increasing residential and commercial infrastructural investment coupled with design innovations in production are propelling the furniture market share. China, India, and the U.S. are among the major construction markets globally. Changing consumer trends accompanied by increasing product launches will stimulate the business growth over the forecast timeframe. Shift in consumer buying patterns owing to changing lifestyles will stimulate the product demand. Regional expansion of renowned brands, providing lower cost residential furniture will stimulate the industry development. For instance, in August 2018, IKEA launched its first store in India to enhance their industry share. Rising outdoor furniture demand owing to outdoor dinner and open-air living, particularly in developed nations will fuel the industry development. Increasing restaurants with outdoor seating supported by high consumer spending on leisure will positively influence the industry revenues. Technological advancements towards development of smart furniture will further support the industry sales over the forecast timeframe. Luxury furniture demand is expected to observe significant gains owing to rising disposable income, affordability and new designs. Ease in raw material availability, increasing industry competitiveness, and enhanced product & colour options will proliferate the business growth. Offices, hospitality, and educational institutions are the major contributors for commercial furniture growth. Proliferating travel & tourism sector with growing investments is further augmenting the furniture market size from 2018 to 2024. As per WTCC, the travel and tourism investment was around USD 883 billion in 2017 and is projected to grow by 4.3% over the next few years. Lower lending rates along with penetration of online stores in emerging economies will surge the global market share. Escalating residential renovation and remodelling demand will strongly support the industry growth. Increasing requirement for replacement infrastructure supported by rise in social gatherings will offer potential opportunities over the forecast timeline. Wood material dominated the global furniture industry share accounting for around 65% in 2017 and is projected to witness a substantial growth from 2018 to 2024. Aesthetic appearance, convenient maintenance, and easy raw material availability are among the key factors driving the business development. Enhanced strength & durability along with higher product options will proliferate the product demand. Availability of multiple raw material types in the segment including pine, cedar, oak, cherry wood, maple and others will augment the furniture market growth. Furniture market from residential application is expected to generate over USD 495 billion by 2024. Booming private housing construction along with government spending on new residential infrastructure to accommodate the rising population will enhance the business demand. Expanding residential renovation and remodelling projects in Europe will fuel the market growth. According to the U.S. Census Bureau, in 2017, the number of single-family homes completed were 795,000 in the country. Rapid urbanization and growing household incomes are among the key factors fuelling the market growth in the developing nations. Bedroom and dining room hold a significant share in the segment. Asia Pacific is anticipated to witness growth at around 5.5% up to 2024. Substantial growth in the regional construction sector owing to developing economy, and favourable FDI policies are propelling the regional growth. Thriving hospitality sector particularly in Thailand, Indonesia, Singapore, Malaysia, and Vietnam owing to favourable geography and favourable FDI policies will stimulate the business development. North America furniture market was over 6 million tonnes in 2017 and is expected to grow at significant rate up to 2024. Trend towards outdoor dining and living will supplement the regional business expansion. Reducing room sizes along with growing rented homes demand among millennials will boost the industry share. Additionally, government initiatives to support other commercial and residential constructions will drive the business growth. Global furniture market share is highly competitive with presence of large number of regional and multinational corporations. The key industry players include Steelcase, Ashley Furniture Industries, Inter IKEA Group, Okamura Corporation, Kohler Co., La-Z-Boy Inc., and Haworth Inc. Other prominent players include the Home Depot Inc., McCarthy Group Ltd, Heritage Home, Herman Miller, and Humanscale Corporation. Mergers, acquisitions, and collaborations are among the key strategies adopted by the manufacturers. For instance, in June 2018, Herman Miller acquired 33% stake in Nine United Denmark A/S (HAY). The other strategies observed in the industry include new product development, and distribution network expansion to enhance the business revenues. The furniture demand varies according to the consumer segment and geographic location. The global market is highly adaptive as per the changing trends and observes increasing competition from new entrants. Industry participants are taking excessive efforts to match customer’s affluence and taste, thus propelling the product demand in both residential and commercial segments. Fuelling demand for multifunctional and innovative furniture to provide additional storage facility and easy portability owing to shrinking size of new housing is shifting the manufacturing trends. Furniture manufacturers are striving to improve their margins by integrating their business and establishing their own distribution network. Government spending on residential and public infrastructure to accommodate the growing population, improving the standard of living, and attracting tourists is creating new growth opportunities for the manufacturers. Expanding demand for products including smart, eco-friendly, and garden furniture is positively influencing the market expansion. Increasing production particularly in developing economies to cater the growing demand has reduced the operational costs and improved profit margins.